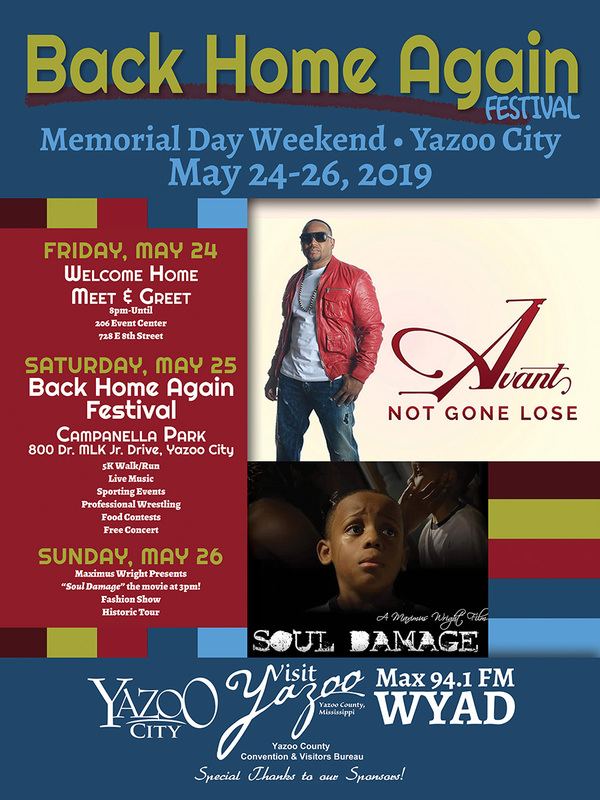 Back Home Again 2019 May 24-26, Memorial Day Weekend Back Home Again Festival May 24 – 26, 2019 Friday, May 24th Welcome Home Meet & Greet 8pm-Until 206 Event Center 728 E. 8th Street, Yazoo City Saturday, May 25th Back Home Again Festival Campanella Park 800 Dr. Martin Luther King, Jr. Drive, Yazoo City 5K Walk/Run Live Music Sporting Events Professional Wrestling Food Contests Free Concert Sunday, May 26 Maximus Wright presents “Soul Damage” the movie at 3 pm! (location TBA) Fashion Show Historic Tour Stay updated at the Back Home Again Festival 2019 event page on Facebook. For more information email stiffboy41@gmail.com or joethomas75@gmail.com Back Home Again is sponsored in part by the Yazoo County Convention & Visitors Bureau (Visit Yazoo).